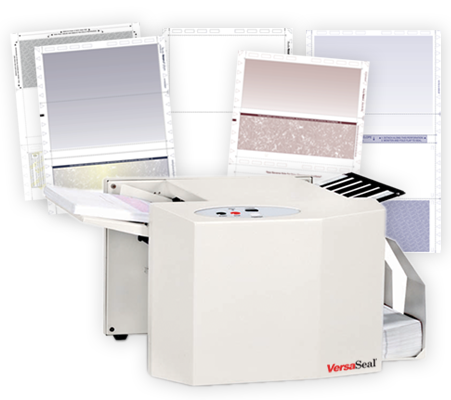 VersaSeal® is the most efficient mailing solution for any kind of business and any size user. Our equipment and documents eliminate envelopes and bypass labor intensive activities like folding, stuffing and sealing. With unlimited options for custom products and a full line of stock items, we can help you design a system that will meet the needs of any customer. NEW! Thermochromatic “VS” ink is now standard on the back of all check stock. The “VS” will disappear and reappear once rubber or exposed to heat. Transcripts, Grade Reports, Class Schedules and more!